Aesthetic theory, the Frankfurter-philosopher Theodor W. Adorno emphasized, should neither stand above, nor outside of the art. UGG Bailey Bow Rather, it should descend – meaning, take one step down – from its historical distant philosophical chair behind the academic desk, and instead expose itself to contemporary art and its manifestations. More so; theory needs to transform itself – to change it´s forms – in meeting with the arts; it needs the ability to “open up”, to adapt. Only then it can – to quote freely from Aesthetic Theory: “say what art would say if art could say it.” Time and again, Adorno demonstrates the fruitfulness of his theoretical program. And through his ability to hear Schönberg’s music, to read Becket’s novels and and to see Paul Klee’s pictures, he largely sets a gold-standard for a method of “close-reading” ore even “close listening”, which will become significant and highly influential for understanding the relation between art and art theory up to this time. However: No matter how important, and fruitful Adorno’s approach still is, I will argue that it embodies a potential problem: For if theories main task should be to open up – to adapt, or to becoming responsive to – art, an asymmetrical relationship between art and art theory may arise. If being given the role of “the responsive” – the one that should only listen to and “learn from” the art – theory could in fact loose its critical – or event dialectical – potential as an “outside eye” (oder in German, “Blick von Aussen”). From here it stands the risk of losing its own potential as a real critical activity; as a medium that could counterpoint art, asking questions which often can be hard to ask when you stand on the inside of a theatre production, or even inside a large opera house or theatre institution. It is exactly this reflexive potential which has caused me to search for what I`ve called a reflexive dramaturgy. Or rather, this would be my theoretical backdrop. My practical, or artistic backdrop, however, lies in more than fifteen years of numerous experiences of how the artist often seems to want what the institutional structures cannot provide: Time and again I have witnessed how good ideas on a new performance, how visionary ambitions on how to work and what to create, have been dragged down by forces of gravity, strong enough to override even the strongest of concepts. For example, I’ve been witnessing how the modernist conceptions of the “pure” or the “absolute” musical composition, still prevents the musician´s ability to to think of theatre as an expanded audio-visual room, and hence the ability to compose with theatre as a whole. I’ve experienced how the Stanislavskij tradition’s psychological methods to reach “realism in the theatre”, at the same time can obstruct the actors’ abilities of more choristic, physical and stylistic expressions. I’ve seen how hard it can be for an actor to combine the so called “psychological processes” or “motivated tasks” with for instance playing on a instrument, performing radical shifts in acting styles, or to involve himself – as himself – in a real discussion with an audience. And I’ve experienced, how these forces tend to manifest themselves even when the musician or the actor (or even the theatre manager) themselves explicitly aims to move away – or to brake out of – these constraints and secede from these prerequisites. For these prerequisites, these constraints can bee seen as a kind of what I have called “gravity forces” which cannot be reduced to mere material or practical limitations, or identified solely to spatial, temporal or economic structures or preconditions. Rather these forces of gravity bring along their own (meta)narratives, yes – and now we are at the core – narratives that actuates their own dramaturgies, strong enough to transform an entire performance, opposing the artistic intentions and concepts planned by the theatre-maker years in advance. Yes, even more, these are structures strong enough to override the content of a play, to penetrate a whole production, and this often with a paradoxical turnout. Time and again one can observe how progressive concepts “does not make it”. We see performances where the structures “backstage” contradicts the thing going on “onstage.” For instance, how shows questioning “hierarchical” structures in society become hierarchical themselves, or how humanistic or even anti capitalistic ambitions are contradicted by the cynicism in marketing and casting. 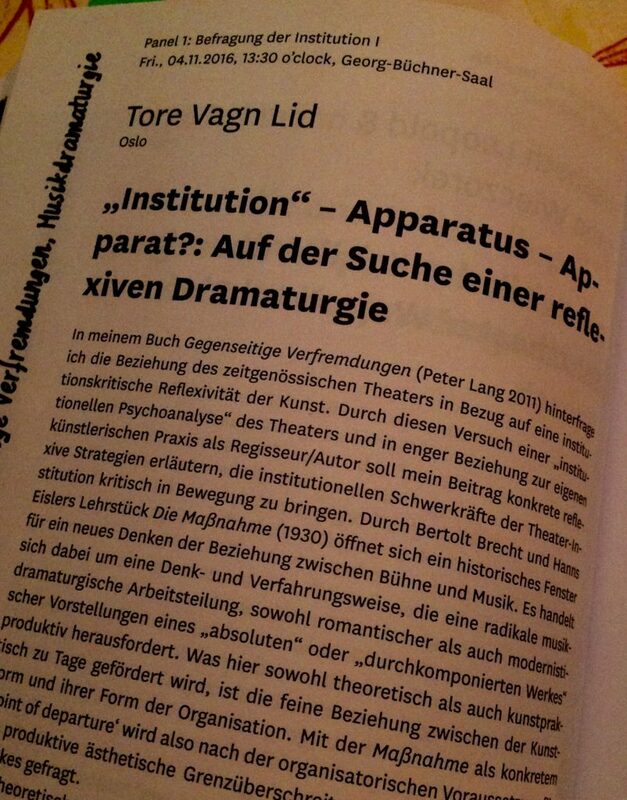 So this notion of dramaturgy can not limit itself just to be «open» and «responsive» for what´s going on in the art field. But in order to be able to contribute to the artistic process itself, it needs to engage in a mutual productive and critical dialectical dialogue with the artistic work, the artistic research. Therefore, the subject, or discipline of dramaturgy, cannot be constrained to a mere question of how a show is built, or a composition structured. Instead it must track its roots back to the original Greek meaning of the word, where the term dramaturgy means “actions that work” or actions, that have an influence or evokes an effect. Hence a reflexive dramaturgy must be able to explore the dramaturgical forces at play beyond or “outside”, but non the less influencing, the dramaturgy of the artistic process and the artistic work it self. This will require an expanded concept of dramaturgy, that needs to be able to understand and to clarify the intimate relationships that will always exist between art-form and forms of organization. In my book titled «Gegenseitige Verfremdingen», written here in Giessen, I have – as an attempt in this direction – argued for the necessity of a psychoanalysis of the institution itself. In other words, a reflexive search for why, and how, certain types of “dramaturgical power fields” have been able to appear and to consolidate over time. Asics Gel Lyte 3 Femme Grise Here I also argue that rudiments and entrances to a kind of reflexive dramaturgical practice in fact can be traced within the aesthetic project of the young Bertolt Brecht. Looking at the relationship between Brecht’s theoretical practice on the one hand, and the development of the musical “Lehrstücke” (Learningplays) on the other, a distinctive figure of institutional critique – or a reflexive logic – can be located and reconstructed. And this is not to overlooked: It is no coincidence that Brecht expresses these thoughts about the apparatus in a text titled “Über die Verwendung von Musik für ein episches Theater.” (“On the use of music for an epic theatre.”) For it is the role of music in theatre, or more precisely, Brechts ritual analysis of the abuse of music in the theatre, that becomes a catalyst for Brecht – both to his diagnosis of the theatre as an ideologically effective “apparatus”, and further in his attempt to re-function this apparatus in an effort to re-think and to re-organize music and musical dramaturgy as such. Already the premiere of the first “Lehrstück”, performed at the contemporary music festival in Baden Baden in the summer of 1929, revealed some important rudiments: The orchestra is visibly seated and transparent on stage. A wreck of a plane on one side of the podium is flanked by a radio on the other. Author (Bertolt Brecht) and composer (Paul Hindemith) are sitting side by side on a desk, facing the audience. Notes are projected on a large canvas, and in the very moment the conductor Hindemith sets the tempo, it is the audience which are invited to a sing-along. Across the podium the director has placed a large banner, with the slogan: ”Besser Musik machen als Musik hören” («It’s better to create music, than listen to music”). Through a conscious dramaturgic approach along several parameters this first Lehrstück tries to highlight and hence activate the traditional concert ritual as a self conscious social space of human practices and actions. The provocation points out a plan, which in the coming learning piece – Die Massnahme – will be developed and strengthened. When Brecht first handed over the sketch for “Die Massnahme” to be read through for the Baden Baden music festival, it was rejected by the jury and returned to the sender with the following inscriptions: “Formal inferiorities in the text”. But, here lies the problem, a problem that I discovered when I got the opportunity to stage «Die Massnahme» for The Bergen International Festival, and later for The Salzburg Festival i 2008. For «Die Massnahme» is in fact not a theatre-play by Bertolt Brecht. Neither it is a libretto material. new balance 1500 bordeaux femme What it is, is a shared composition for the theatre-venue, composed step by step, moment by moment, by the composer Hanns Eisler, the director Slatan Dudow and Brecht. Hence the score is the play in itself, or the other way around, the play is the score, and the score is in fact a music-dramaturgic entity and at the same time a performative – almost actionist – plan, where actors, musicians and chorists, poetic structures and musical structures merges into – and are discussing each other – as a strange kind of dialectical oratorium, not for– but with the audience. I could have gone further in to the transcending implications of this music-dramaturgical experiment, but here I will just briefly leave you with an argument developed further in my book “Gegenseitige Verfremdungen”. 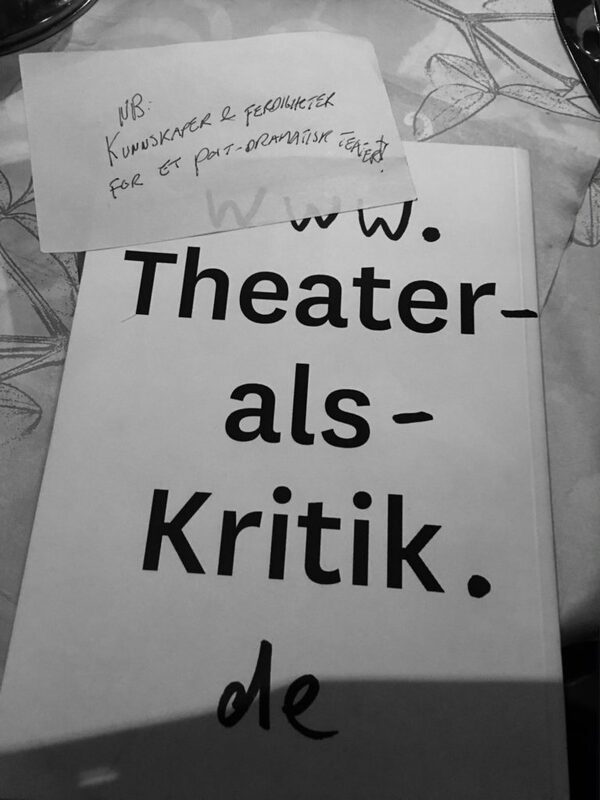 Brechts aesthetic diagnosis, his critique of a dominating dramaturgical praxis – where automated forms passivate the artist and the audience alike, finds itself counterpointed by the first radical approaches towards Die Lehrstücke. A movement – so to say – from Critique of Art to Art as Critique, an artistic model for transcending an institutionalised alienation. Therefor it is interesting that Adorno – both in his “Aesthetic theory” and in his “Philosophie der neuen Musik”, remains blind to the revolutionary aesthetic and music-dramaturgical potential of “Die Massnahme”. Against Adornos credo on aesthetic theory as a kind of “reading with the Art”, I would argue that Brecht present us with an alternative theoretical strategy – that is: Verfremdung not only as an artistic method, but as an option for the Art to use Theory to confront itself and its apparatus. Simultaneously it becomes a method for transforming these insights into material or content for modern art itself. With this Brecht can be said to open up gates and perspectives for a reflexive dramaturgy. Still these are historic fragments from an epoch quite different from the field of gravity created by todays institutions and art-organisations. nike air huarache ultra donna So the question is: If the ambition is to develop a reflexive dramaturgy of our time – how should we then expand or supply our theoretical framework? If “Verfremdung” can be understood as an aesthetic “selbst-verfremdung”, so to say the art apparatus self-confrontation “from without”, it is not at all that paradoxical that also other supporting pillars for a reflexive dramaturgy –are to be found at a quite far distance from the typical discourses and references of traditional aesthetics and theatre research. These are the thoughts, which will be developed and corrected, both by French philosopher Michel Foucault, and later on by the Italian philosopher Giorgio Agamben. But as time now is running out, I will her just leave you with Michel Foucaults attempt to encircle his own interpretation of the French term “dispositif” – here referred and translated by Giorgio Agamben as “apparatus”, in his essay “What is an Apparatus?” (So, quoting Agamben, quoting Foucault: ) «What I’m trying to single out with this term is, first and foremost, a thoroughly heterogeneous set consisting of discourses, institutions, architectural forms, regula­tory decisions, laws, administrative measures, scientific statements, philosophical, moral, and philanthropic propositions-in short, the said as much as the unsaid. Scarpe Air Foamposite Such are the elements of the apparatus. Maglie Utah Jazz The apparatus it­ self is the network that can be established between these elements …» It has been said that Foucault, by emphasizing dispositive as..“The said as much as the unsaid” points to forces connected to the apparatus – like architecture, images, procedures etc. – which are working behind, or outside, the discursive language, but still are highly influential and powerful. Timberland Enfant From here a thin critical red line becomes visible, reaching from Foucaults and Agambens “Dispositif” back to Durkheim and Webers views on how institutions creates behaviour, but even more so revitalises the young Brecht and his concept of Critique. From this perspective it is exactly when art- and artists start fetishizing “the free”, “the spontaneous” and the “natural”, that the unconscious dramaturgy of the apparatus- or the “dispositive” itself can maintain its position. Hence: From fear of “the academic”, of “academic thinking”, deep rooted in an artistic tradition cultivating “spontaneity”, “authenticity” and “emotionality” a danger occurs: Because this prejudices can in fact prevent the artist to understand and to articulate the aesthetic-dramaturgic “gravity-forces” that tends to slip under the radar of the everyday discursive logics of theatre. Forces that no matter how will influence what in the long run can be organised, produced and communicated from stage. Therefore: To talk about aesthetics without talking about sociology is just as problematic as separating art form from organisational form. The question concerning a reflexive dramaturgy should therefore not be located outside – nor or above – artistic practices, but is in fact a crucial part of this practice itself. «Deshalb bedarf Kunst der Philosophie, die sie interpretiert, um zu sagen, was sie nicht sagen kann [..]»  Lid: ”Gegenseitige Verfremdungen” (Peter Lang, Verlag, 2011)  These are slow moving structures where agreements, contracts and infrastructure – together and over time – have been able to shape the gravity fields of todays art-institutions. Hence critique from this perspective can first be made possible through a reflexive self critic, a self-Verfremdung from the side of the theatre apparatus.